Engagement photos are gaining in popularity today, and it’s easy to understand why. They are perfect for capturing a couple’s love and admiration for one another, before the chaos and stress of the wedding planning. It can be a peaceful time in a couple’s relationship, and one that is lovely to have in photographs. 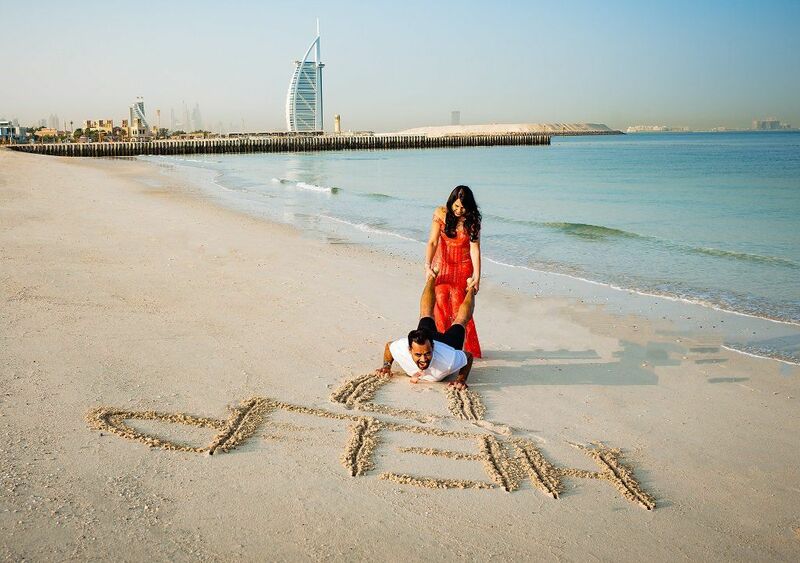 Asha and her fiancé decided to do just that, and had an extensive shoot done in Dubai, in the United Arab Emirates. Dubai is the largest city in the UAE, and sits on the southeast coast of the Persian Gulf. It is one of seven emirates that make up the United Arab Emirates, and is more like a city-state than a traditional municipality. It is a blend of tradition and futurism, mixed with high-end shopping and opulent palaces, not to mention a very active nightlife. The area, rooted in Islamic traditions, welcomes newcomers and visitors openly. With the help of a professional photographer in Dubai, Marius, Asha and her fiancé were able to have their engagement photos taken in multiple locations, showcasing the scenery of Dubai, and their own personalities perfectly. They even changed clothes, going from a more formal look to a casual, light and fun look, which is also reflected in the images. The photos begin with the couple on a beautiful white sand beach, the perfect blue water of the Persian Gulf behind them. 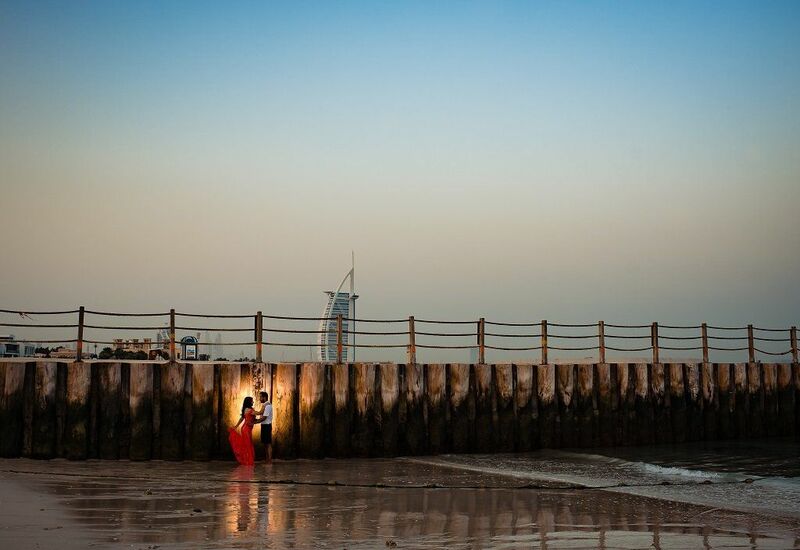 Marius managed to capture the iconic Burj al Arab hotel in the background, leaving no doubt as to the couple’s location. It is Dubai’s very own Eiffel Tower! Marius then took photos of the couple in a second location, or rather a series of locations in one area, including a long pier, a beautiful garden and a boardwalk with views of the futuristic downtown and famous Burj Khalifa. Dressed more casually in white, the couple holds hands, dances, laughs and simply enjoys their time together. Marius used the location to its full advantage and took many amazing photographs of Asha and her fiancé. The site had some spectacular architectural features, and the lighting could not have been better. Marius captured some really special moments between the lovely couple. He was able to take the very best pictures to remind them of their time together in beautiful and unique Dubai. Asha and her fiancé were clearly very comfortable sharing their affection in front of Marius, as he was so professional. Looking at their photos, it was easy to forget that the photographer is even there, as they were simply living in the moment. Moreover, Marius let the couple enjoy their time together and the photo shoot without being too intrusive. None of the photos are too “in your face” or inconsiderate. Nor do they feel overly posed or rigid. Instead, they are natural and beautiful, showcasing the couple at their best. It is important to share major relationship milestones with those we love, and engagement photos like these are the perfect way to do it. 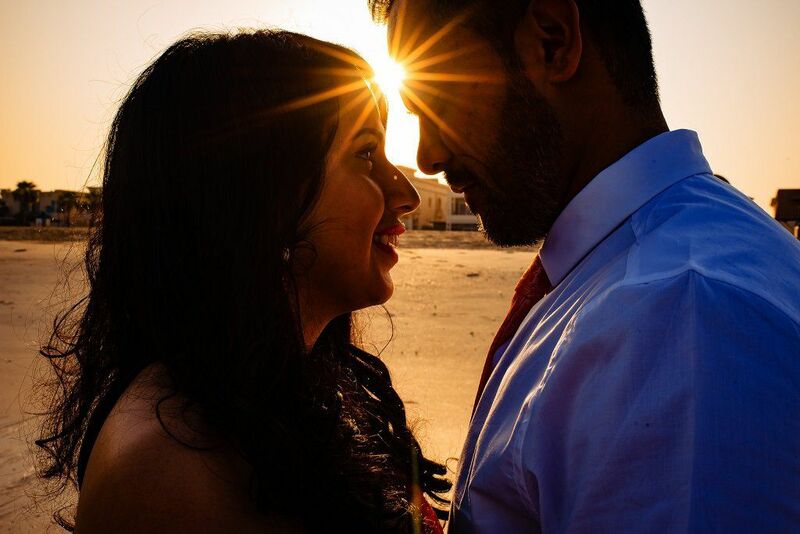 Asha and her fiancé, can remember their time in Dubai, but also share these very special, high-quality images with all of their family and friends, use them for “save the date” notices for their upcoming wedding, and as home decor. Every special moment can be captured by one of our professional photographers and supplying our clients with high-quality and professional pictures no matter the occasion and setting.